Beets are part of the Amaranthaceae-Chenopodiace family, along with swiss chard and other root vegetables. Most of beets you find in the grocery are red in color. However, they can range in color from pink to red to yellow. Beets are well known for their sweet and earthy flavor, which many people have a strong liking or disliking to. 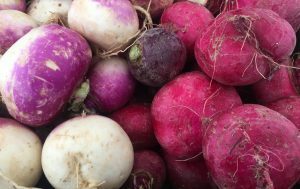 Beets are in season in the seacoast area from end of June through the end of October. However, they are often available at the farmers markets through December. In a 3.5 ounce serving of beets there are 44 calories, 2 grams of fiber, 20% fiber, 16% manganese, 9% potassium, 6% vitamin C, 6% magnesium and 4% iron of the daily recommended values. Beets contain high levels of organic nitrates, which have been shown to lower and stabilize blood pressure levels. The nitrates in beets have also been shown to improve athletic performance by improving the mitochondria’s ability to produce energy, therefore improving oxygen use and decreasing the amount of time it takes to get to exhaustion. Beets also contain the pigment betalains, which have been shown to have anti-inflammatory properties. 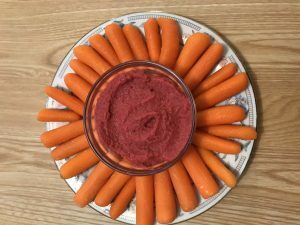 Below is one of my favorite ways to incorporate beets into my diet, beet hummus! The taste of beets is more subtle in this dish, so it is perfect for people who are just beginning to eat beets. I usually pair this hummus with chopped vegetables, like carrots, cucumbers or bell peppers, or with pretzels! Wash and trim beetroot. Place beetroot in a large saucepan and cover with 2cm of water. Drain and let beetroot cool. Peel and cut into slices. Pour rinsed chickpeas onto half a kitchen town. Fold the other half of the towel on top of the chickpeas and rub them so that the skins begin to peel off. Place the peeled chickpeas into a food processor, with salt, cumin, garlic and beets. Turn the food processor on to break up the mixture. With the food processor running, pour in lemon juice and olive oil. Let the processor run until the mixture is smooth. Pro Tip: When you are washing and trimming you beetroot, trim off the leafy green tops. They are edible and a great substitute for spinach or swiss chard!